If countless numbers of people throughout history have wished for an early menopause, probably no one wished more devoutly for it than Thomas Aquinas. No doubt he literally prayed for it morning, noon, and night. A picture comes to mind of him kneeling in his cell, pleading with the Virgin for release from a burden even Job hadn’t been forced to bear. 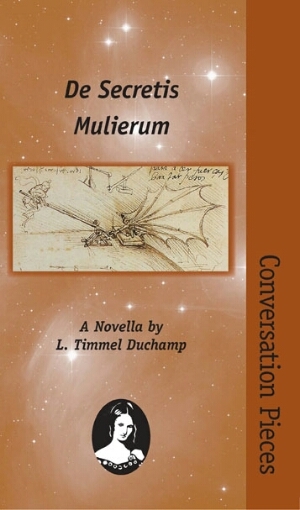 De Secretis Mulierum is one of the Aqueduct Press Conversation Pieces, written by the woman who started the series. Duchamp’s entry is in a variety of conversations in and about history, as well as gender; but how does it stand up? De Secretis Mulierum feels in some ways like one of those college romance novels a certain kind of lecturer writes, only inverted; here, we see the relationship from the point of view of the grad student who feels like she can’t leave for fear of retribution. We see an abusive relationship, never called that, but painted in all the colours of control, denigration, shame and apology; we see Pendler justifying Teddy’s actions to herself increasingly desperately and increasingly knowing that those justifications just aren’t true. It’s an impressive feat of writing, making Teddy an academic blowhard and an emotionally abusive partner while not rendering him a fool; and while also making us empathise with Pendler really strongly. Mind you, that’s more subplot than plot. The romantic element of the story plays into the main theme, but only plays into it. De Secretis Mulierum is really about how far one would go to buck an establishment’s orthodoxies, knowing one was right, when those orthodoxies refuse to be bucked. Duchamp doesn’t make it, in her novella, questionable as to whether Aquinas and Da Vinci are female; indeed, the unquestionableness of that femaleness is part of the point. Da Vinci, of course, has for a long time been seen as gender noncomforming, hence the acceptability to Duchamp’s version of the establishment of “him” as a woman; Aquinas, with his misogyny and academic genius, however, proves more of a sticking point. De Secretis Mulierum is a discussion of why that might be – the gendered associations we have with genius, with logic, with art; our understanding of religion; or the threat to the male establishment Aquinas’ true gender being revealed would create. Duchamp explores this fascinatingly, integrated into her story of Pendler’s persistent continuation of her project looking at the true gender of Da Vinci; she draws Teddy’s personal misogyny together with his academic resistance. De Secretis Mulierum explains and elucidates on the relationship between the personal, the professional, and the political; the relationship between Pendler and Teddy is just one of a number of tools for doing this, and it works incredibly well. This is the first Conversation Piece I have read, and it is fantastic; I highly recommend De Secretis Mulierum, especially to anyone planning to advance a theory that will buck the academic establishment! By Intellectus_Speculativus in Review on October 14, 2014 .